Keep kids energized and satisfied with this delicious, healthy wrap made with hummus and veggies. 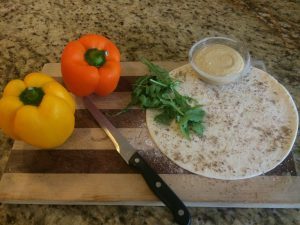 Ingredients 6 8-inch Whole wheat tortillas 1 1/2 cups Prepared hummus 1 cup bell pepper (cut into 1/4-inch strips) 1/2 cup Carrots, grated 1 1/2 cups Baby spinach leaves Directions 1. Place the 6 tortillas on a clean surface. 2….